A heavily overcast day, threatening rain, I opted to catch up on one of the many chores that I usually put off to go birding. This one entailed a visit to a garden centre at Lauderdale, but with an eye to a quick birdwatch. Purchase concluded, I made the short trip to the canal, having decided that with the tide well out, there would be little to see on the spit. The canal is less than a kilometre long, around 10 metres wide and perhaps a metre or so deep, lined with large well spaced eucalypts--it is blocked at one end. Its days as a short cut from Ralph's Bay to Frederick Henry Bay lasted a few days. A storm blocked one end and it was never re-opened. This results in small fish entering on the high tide and provides a great place for herons, egrets, terns and cormorants to get a quick feed as tide recedes. As I scanned the length of the waterway, I noted a gathering of Silver Gulls near a drain about half way along, and on closer inspection I could make out a number of diving cormorants. 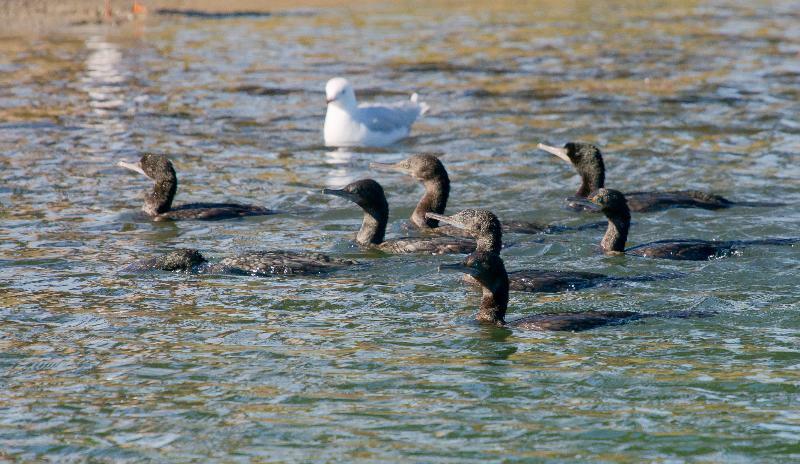 These turned out to be a group of around 20 Little Black Cormorants, and not the usual Black-faced and Little Pied. 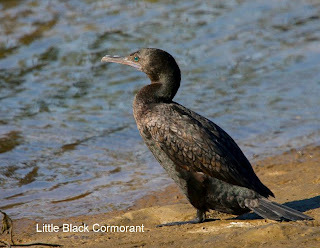 Although Little Blacks are by no means uncommon, they are the least likely to be encountered, at least in the south east. 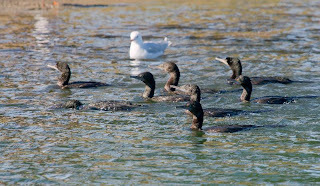 A cormorant roost at Gould's Lagoon at Granton, is the best local spot to see them, where they share the roost with Great and Little Pieds, or in Derwent Marshes nearby. Where they are seen they are usually in flocks numbering in the tens of birds, but occasionally in the hundreds. Although I had my trusty camera with me (no I don't take it bed), the conditions were marginal for photographing black birds in 'dark' water, and I was content to just watch. Little Blacks work cooperatively, 'herding' fish together or, as in this case, into shallow water, before rather frenetically diving into the school to catch their 'share'. The gulls hung around hoping to get the leftovers, and a White-faced Heron raced back and forth along the bank in excitement, but only managing to seize an occasional fish and was in turn set about by the Silver Gulls, who, despite their efforts went largely unrewarded. It was fascinating to observe the interaction between the species. An occasional Crested Tern put in an appearance, and I noticed a Pacific Gull with a small fish, which I suspect had been pirated from a cormorant. So where did the photographs come from? Well I returned the following day in the hope they would return, and initially I was disappointed and went elsewhere to birdwatch. Returning a few hours later I found them drying out on the canal bank, possibly having fished in one of the nearby bays. Watching them for some 20 minutes, they must have noticed fish surfacing because they suddenly half flew, half fluttered 50 metres down the waterway and started fishing. They bunched together, one or more with head submerged, swimming rapidly. If one dived the others would quickly follow. Trying to get decent shots during this operation proved elusive as they frequently changed direction, dived or flew several metres and recommenced their efforts. It was all over in minutes and they emerged to dry out again further down the canal. I did manage the image at centre, with the bird apparently "washing". Most cormorants do this before roosting, especially the Black-faced. I had previously concluded that it was indeed "washing", but I'm pretty sure that I'm wrong. I think they are probably fluffing their feathers to get the air back in them. This would improve body insulation and aid drying. I would be pleased to get other people's thoughts on this. Thanks for your feedback John. 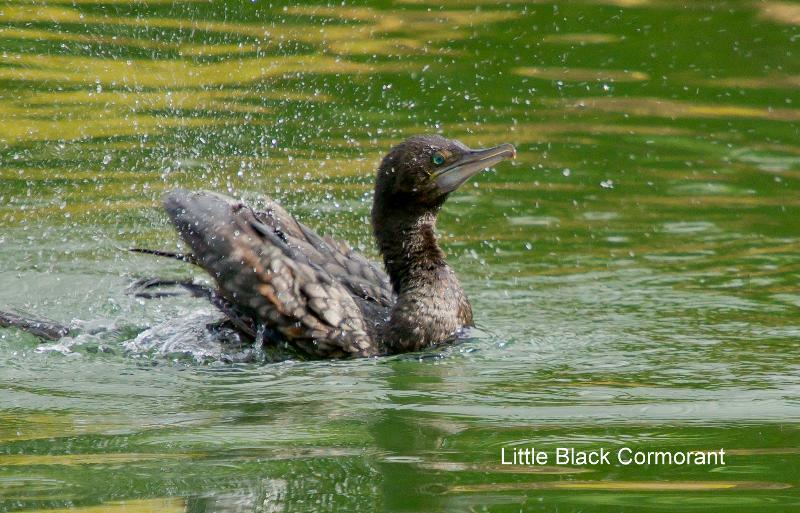 I've photographed cormorants "washing" many times, but I've been puzzled by the thought 'why would a bird that spent a long time in the water need to wash'? It didn't seem entirely logical. So why? The only explanation that seemed to have any credence was that they were getting air back into their plumage, much as passerines puff up their feathers on cold mornings. But I know only too well, it easy to jump to the wrong conclusions! While it's 'nice' to get shots of birds in typical poses, I think shots of birds doing their thing is generally neglected--including by me. Given that it's easy to get usable shots with modern gear, it would be good to move on to more "action" images.